VIP Industries continues to be the market leader in the luggage category but is grappling with a serious perception issue. Dilip Piramal, Chairman, VIP Industries, has an unusual problem. His 40-year-old luggage brand, VIP (along with Skybag, Aristocrat and Alfa), has over 50 per cent share of the Indian luggage market, but is being perceived as ageing. When Sohum Bhowmick, 23, visited a Shoppers Stop outlet to buy a strolley for a business trip, he chose Samsonite over VIP, even though the former came at double the price. "VIP is an old and trusted brand but I don't find it sleek. It's a brand my father swears by," he says. Piramal agrees that a lot of consumers, especially the young, are shying away from the brand. "They want excitement. In my own circle, nobody uses a VIP product. In the beginning, I used to be a bit disappointed, but now I realise that if I was not the owner of VIP I would also not use its products." In the late nineties and early 2000, VIP had 70 per cent share of the luggage market. This is now down to 50 per cent. The reasons for the slump range from the onslaught of slicker global brands such as Samsonite to a battle of perception that experts say it took too long to come to terms with. But now, it's fighting back. The efforts, led by Dilip Piramal's daughter Radhika Piramal, hinge on entry into the big-yet-untapped handbag market where sales are more frequent and launch of sleeker brands in price ranges where it has traditionally been weak. "VIP doesn't have an offering in the premium segment (more than Rs 10,000 price tag). Its products are priced at Rs 6,000-7,000, where they are facing stiff competition from new-age brands such as American Tourister (Samsonite's mid-segment offering) and Delsey. Though these are not necessarily sleeker than VIP, the fact that they are fashionable international brands gives them an edge," says the head of a leading large-format retail chain. It is not that VIP has been a laidback brand ever. In fact, it has always been up there in terms of brand building. Piramal did not reduce advertising budgets even during the economy's worst phases that sharply pulled down consumer spending. Also, to beat global brands, it launched products of Carlton, a British brand it bought in 2004. Still, sales have been growing just eight to nine per cent a year, on a par with the industry average. In 2014/15, consolidated revenue grew 7.7 per cent to Rs 1,047.7 crore. Profit after tax and exceptional items fell 19 per cent to Rs 46.6 crore from Rs 57.7 crore the year before. It needs to be mentioned that the 2013/14 profit had included gains from sale of securities and a property in Mumbai. Samsonite, which entered India in mid-nineties, had revenue of around Rs 1,000 crore in 2013/14. Dilip Piramal blames the slump partly on changing consumer preferences. For one, there has been a clear dip in demand for hard luggage, VIP's forte. The senior management failed to foresee this change. The company did launch a soft luggage brand, Skybags, in the eighties, but didn't invest enough in it. It died a slow death. Piramal says after the late nineties, due to the exit of Managing Director Sanjeev Aga - who quit to head Idea Cellular - the company faced a leadership crisis. "We couldnt afford to retain Sanjeev. None of his successors had the foresight to take the business to the next level. We were not able to attract good talent." The company started losing market share to Samsonite, which by then had realised that the premium end of the market was untapped. It launched American Tourister to counter VIP. To make matters worse, VIP's profitability fell to low single digits at the start of 2000. Under Aga's leadership, VIP had even forayed into the international market. "VIP wanted to be world class. We were sitting on the same shelves in leading departmental stores in the UK and the US as Samsonite and Delsey," says Aga. Piramal gives him credit for spoiling Samsonite's plans for the first three-four years. "We took steps to become a top-notch design company and launched VIP Elanza to counter Samsonite. In fact, despite being market leaders across the globe, Samsonite didn't have a product advantage in India during the initial years," he says. Later, VIP could not maintain its thrust on cutting-edge products not available in India, says Aga. "VIP is successful, but it is not as brilliant as it could have been," he says. In 2008, Radhika Piramal took over as managing director. Though the senior Piramal trusted her predecessor, Sudhir Jatia, whom he had brought in as managing director in early 2000 after acquiring his brand, Aristocrat, he didn't agree with some of his decisions such as keeping VIP away from hypermarkets and re-launching Skybags as a discount offering, especially when research indicated that VIP was being looked upon as an ageing brand and re-launching Skybags as a youth product would make more sense. An MBA from Harvard Business School, the first thing 36-year-old Radhika Piramal did after entering the business was to make VIP contemporary and offer variety. To bring in an international touch, she launched Carlton. In 2012, she relaunched Skybags as a youth brand, and brought under it a host of products such as backpacks, which appeal to the youth. "The first strolley in the Indian market was from Skybags but the brand somehow lost steam. My goal is to offer enough choice so that consumers don't have to go anywhere else," she says. Radhika's entry, says her father, breathed fresh air into the company. "The best thing was that she was able to attract good managers. People were again willing to work with VIP." But the company has been lying low for too long. The competition has covered a lot of ground. In the Rs 2,000-odd crore organised luggage industry, Samsonite has over 90 per cent market share in the premium category (over Rs 10,000 price tag). This category accounts for around 10 per cent market. VIP does not have a presence here. 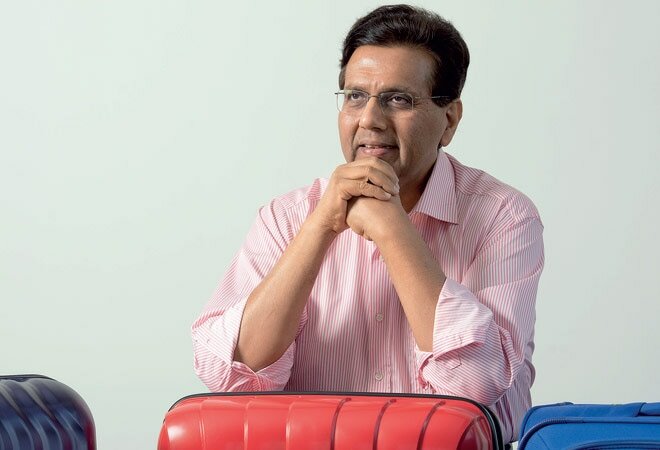 In the Rs 4,000-10,000 range, VIP is neck-and-neck with Samsonite's American Tourister brand, though Samsonite Managing Director Suresh Menon says they have an edge over VIP even in this segment. "Skybags starts at Rs 2,000 and not Rs 4,000. VIP is a clear market leader only in the sub-Rs 3,500 segment, where we are not present. Therefore, if you ask me about market share, I will refuse to answer." One of the biggest hurdles in growth of the industry is that repeat purchases are few. Therefore, globally, Samsonite has been trying to position itself in the premium category by acquiring brands peripheral to the luggage industry. These have been contributing 12-15 per cent to its revenue for the last four-five years. In 2012, it acquired High Sierra, which makes luggage and accessories required for trekking, hiking, etc., and launched the brand (priced between Samsonite and American Tourister products) in India. In 2013, it acquired Hartmann, a luxury luggage brand, and opened Hartmann stores in Mumbai, Bangalore and Delhi. "We recently acquired French brand Lipault, meant for women. It has vibrant colours and soft textures. We are launching it in India in August. We are also looking to acquire local brands, especially in the sub-Rs 3,500 segment," says Menon. Though Piramal is proud of creating brands for various segments, marketing gurus don't agree with his strategy. When one has six brands, each has to be positioned differently. VIP, says a senior brand specialist, has done just the opposite. "They brought in Carlton at the premium end but killed it by discounting it repeatedly," he says. In fact, if one were to walk into a VIP store and ask the salesman the difference between Carlton and VIP, it is unlikely that he would know as pricing is identical. Radhika Piramal doesn't agree. "VIP has a clear brand portfolio for all segments. Carlton is our premium offering, aimed at the professional business traveller who prefers to use international brands," she says. Carlton is priced at Rs 6,000-15,000, compared to the Rs 3,000-8,000 range for other VIP products. "Carlton is growing 30 per cent year-on-year," she says. The company, says the brand specialist, has made another mistake. It sells Carlton and VIP at the same stores. "It is important for Carlton to have a separate identity so that consumers understand what it stands for. They have confused consumers by selling VIP, Carlton and Aristocrat, which is their mass brand, in the same stores." Here again, Radhika Piramal has a different take. "We view the Indian market through a brand lens, not a retail-only lens. Our company's strategy is to advertise our brands and ensure wide availability, made possible through VIP's distribution network." She says restricting Carlton to a few exclusive stores will limit sales, although setting up exclusive stores is also a part of the company's strategy for the future. With the luggage industry growing at just eight to nine per cent a year, it is mandatory to diversify. While Samsonite has moved into specialised luggage, VIP has chosen the handbag category with Caprese. The Piramals felt that unlike luggage, which is a one-time buy, consumers don't shy away from owning multiple bags. Also, it is an unorganised market with a handful of brands, of which the only one with some scale is the Rs 160 crore Hidesign. "There was a clear gap in the branded handbag segment. Hidesign is premium and sells only leather bags. Others don't offer good international styling," says Radhika. The company, therefore, decided to launch Caprese at mid-premium price-point (lower than Hidesign). "We priced our bags at Rs 3,000-5,000. We felt it's the right price to be in so that we can earn some margins and still sell enough," says Radhika. Marketers say getting into bags is a logical move. They are critical about Samsonite, which is investing only in luggage. The company, some time ago, did get into bags, but quickly withdrew. Though Radhika is optimistic about making Caprese a Rs 100-crore brand in the next few years, her father isn't too happy about the way it has grown since its launch in 2012. "There was no mass handbag brand in the country, but Caprese is taking a bit longer to grow than I had expected," he says. Dilip Kapur, founder of Hidesign, says the fundamental mistake most handbag brands in India are making is copying not just global brands in style and design but are also adopting names that sound international. "Importing from China may give higher margins, but in the long run they can be successful only if they can create a distinct identity. They can create a successful brand only if they can tell consumers what they stand for," says Kapur. Radhika Piramal, however, is upbeat about Caprese and hopes it will help her double VIP's turnover to Rs 2,000 crore in the next five years. But marketing gurus caution her and say the need of the hour is to think and implement a distinct strategy instead of disparate tactical moves. "By mindlessly advertising and continuously discounting products, the company will cause more harm to itself rather than harming competition," says Peshwa Acharya, former chief marketing officer, Reliance Retail, who is now an entrepreneur. Whatever the end result, expect a bagful of surprises from India's biggest luggage maker.